The smell of cinnamon brings a decidedly warm and festive feel to the air, and it is most often associated with the fall and winter months. Cinnamon tea can be a tasty change after the lighter mint and lemon herbal teas of the spring and summer months, and it also offers a host of health benefits. The cinnamon spice actually comes from the bark of a tree, and there are multiple varieties. It is commonly used as a cooking spice and a fragrance in candles and bath products and is a primary ingredient in the traditional Korean drink Sujeonggwa. Improve circulation. The natural warming effect of cinnamon works in combination with its blood-thinning properties to increase the efficiency of your circulatory system and make it easier for your heart to pump blood through your body. Lower blood sugar. Cinnamon’s polyphenols have been shown to lower blood sugar, particularly in those with type 2 diabetes. Relieve pain. Cinnamon’s anti-inflammatory properties mean it can help reduce aches and pains associated with muscle soreness, headaches and even menstrual cramps. Improve mood. Cinnamon is a nostalgic spice for many, and if the warm fragrance calls to mind good childhood memories centered around baking, the holidays or just spending time with friends and family, it can provide an immediate mood boost. Increase energy. The scent of cinnamon improves mental alertness and physical energy. Calms upset stomach. Cinnamon soothes the digestive tract, but it also has anti-viral and anti-bacterial properties, helping you fight off stomach bugs and boosting your immune system overall. Cinnamon has also been shown to inhibit yeast growth and may help those with recurring yeast infections. The most important thing to be careful about when brewing cinnamon tea is the strength. This spice packs a powerful punch, and it’s best to make it with a light hand. To make your own cinnamon tea, you will need cinnamon sticks. Ceylon cinnamon is best for this recipe, as this is one of the sweeter varieties and adds another dimension to the flavor without bringing in additional calories or sugar. For every 1.5 cups of tea you are brewing, you’ll need one stick. Break the sticks up, add them to the water, and bring the pan to a slow boil. Simmering the sticks over a longer period — 15 to 20 minutes — releases more of the flavor. Before serving, let cool for another 15 minutes or so to let the rest of the flavor and color out of the sticks. 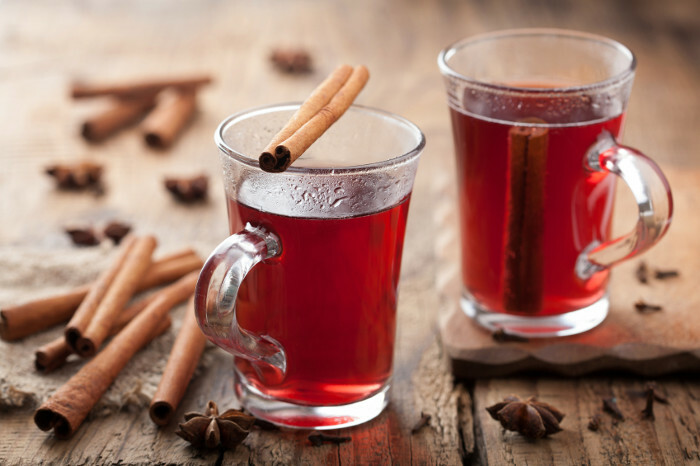 While cinnamon tea is quite flavorful on its own, it also pairs well with other traditional holiday herbs and flavors like rosemary and cranberry. 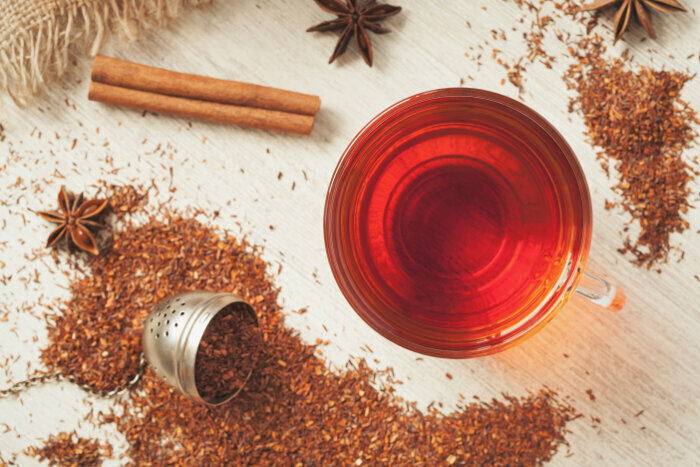 You can serve other tea blends with cinnamon sticks for a hint of extra flavor and added visual appeal or play on the spice’s naturally warming effects and serve it iced. If you’re using cinnamon to open up your nasal passages or help treat a cold, pairing it with ginger and some raw honey may increase its effectiveness. Because of its spiciness, it’s important to use cinnamon in moderation. In high doses, it can irritate the delicate membranes on the inside of the mouth and lips, and cassia cinnamon in particular can cause issues for some people when used in large amounts, according to WebMD. Cinnamon’s effect on lowering blood sugar also means that those who are diabetic should talk with their doctors before adding cinnamon teas or supplements to their diet. It’s important to monitor blood sugar carefully for any changes and to see if there needs to be an adjustment in the medication.